Sheer Kurma is a traditional East Indian recipe and is always counted in Mughlai style of cuisines. This recipe is native to persia but it became a popular cuisine in India during the Moghul era. Sheer Kurma is served during Eid and is prepared otherwise mostly in winter seasons. This kind of dessert tastes best during winters and foodies bet on this words when it comes to this delicious dessert. 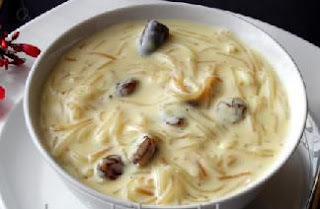 Sheer kurma is a persian term , sheer means milk and kurma means dry date. This dish is served on the morning day of Eid in the family right after the morning prayers and is considered most important food of the eid festival. It is there after served to guests and relatives. This is a kind of dessert and can be served either cold or hot depending how a person wishes to have it. Vermicelli is easily available these days in market and that makes it easy to prepare it. Though the very names of Sheer kurma says its difficult to prepare, it isnt really hard to cook it. Any average or new beginner can try on this with good results. Just all that should be noted is few tips. Hope it pleases all. Dry dates - 5-6 nos, soaked and chopped into 4 pieces . Take a deep bottom vessel and pour milk in it. Bring the milk to boil on a medium heat. Once it boils, turn the flame to low and continue to heat it . Let it boil till it reduces to 2/3 quantity. Now add sugar and continue to boil till the sugar gets dissolved. It takes about 5 minutes. Keep stirring while the sugar gets dissolved to avoid the sugar from sticking the bottom of vessel. Add the raisins and dates when the sugar gets dissolved and cook it further for 5 minutes. Now add the vermicelli and cook for 3-4 minutes. Keep stirring often. Add the saffron (kesar) to it milk and stir well. Once the vermicelli softens , reduce the heat and cook it for 15 minutes more. Now turn off the heat and add the rose water and kewra essence. Keep it aside for some minutes. Garnish it with chopped and blanched almonds and pistachios. Serve hot or cold as per desire. Serving Suggestion: Serve hot either hot or chilled after meals. Roast the vermicelli till it changes the colour. But dont ever over fry it. Reduce the milk to some quantity by heating it. U can measure it by the thickness of milk . You need not Reduce it to half the amount but just 2/3 of quantity. For blanching the almonds and pistachios, boil 2 cups of water and put the almonds and pistachios in it. Keep it inside the boil water for some 10 minutes. Then drain the water and removed the skin. You can then chop them thin into desired shapes . Kewra essence is available in market. It is used to add a aromatic touch to the cuisine. Rose water too does the same. Saffron is added to give the cuisine a good colour. Click here to learn more about Uttarpradesh Foods and cuisines : An Introduction To Uttarpradesh Foods and Cuisines. Click here to learn more about Indian sweets and Desserts: An Introduction To Indian Sweets And Desserts.